In the first article of our series, we discussed the most important trends within the bioprocessing industry: continuous processing, single-use technology, and improving process productivity. These goals have become increasingly important as the bioprocessing industry has quickly become a competitive field due to demand of biosimilars and expanding development and regulatory approval of biologics-based therapeutics. In fact, our analysts determined that the bioprocessing market was more than $8 billion as of 2017 and will continue to grow at an aggressive rate of 8.7% per year for the next five years, approaching $12.4 billion in 2022. Of the 212 life scientists surveyed, nearly half were conducting research to produce biosimilars. In this article we’ll discuss some findings from our 2018 Bioprocessing Market Analysis and Perspectives report. We reflect on the current overall market demand and the driving forces behind this relatively high growth rate and break down some of the technologies that make up the upstream and downstream phases of bioprocessing and how they contribute to growth. Bioprocessing utilizes highly specialized equipment and processes which are subject to stringent regulation. 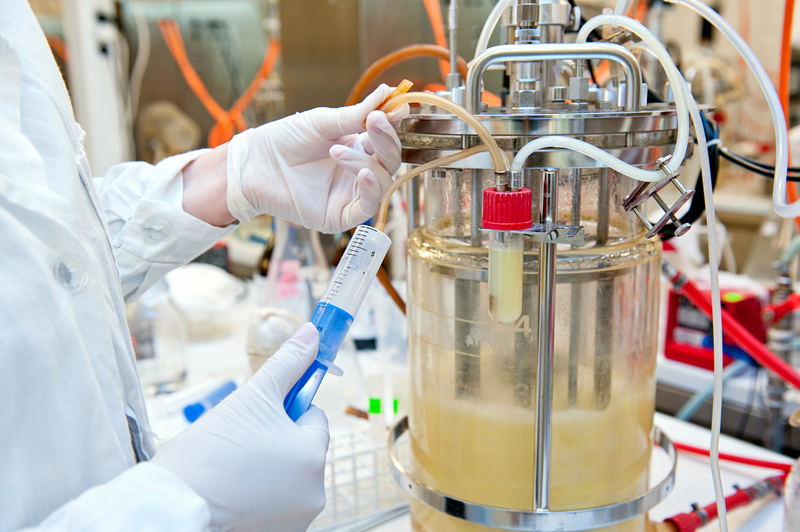 Production-scale bioprocessing is more than a collection of individual instruments. Manufacturing equipment is often custom built to facilitate carefully planned production flow through the entire manufacturing process. Once you’ve done the basic R&D and established the cell line, the next step is growing it on a bench-top scale, to high optical densities (OD) so that it can, in turn, produce high yields of your target biomolecule. Cell culture media for growth can contain a variety of nutrients and composition heavily depends on the cell type, whether it is bacteria, yeast, or mammalian cells. Often, certain components and acids normally found within media can be toxic to genetically engineered cells, and therefore need a very specific environment simply to survive. In addition to the basic nutrients, media has extra supplements to produce high optical density of cells and/or high yield of the target biomolecule. As this first step is paramount to the next steps of bioprocessing, it’s reasonable that cell culture media took almost a third (29%) of the overall bioprocessing market share in 2017. However, in alignment with the goals of the industry, our report shows that the demand for single-use bioreactors and process chromatography will lead the growth over the next five years. Which leads us to the rest of the technology within the market spread between conventional bioreactors, single-use bioreactors, filtration, and process chromatography. Though conventional bioreactors have an expected growth rate of 7.2% over the next five years, they are quickly losing ground to single-use systems. Demand is led by pilot-scale systems, with capacities in the 20L- 100L range. We previously discussed the benefits of single use bioreactors compared to conventional bioreactors including reducing cross-contamination risk, fewer maintenance requirements and so on. Single-use bioreactors also have certain limitations in terms of functioning capabilities, such as being non-customizable for specific molecules, difficulties with scale-up and scale-down, and lower oxygen transfer rates to name a few. Yet, this segment alone will experience a predicted growth of 10.6% per year through 2022. Though direct flow filtration and tangential flow filtration are currently the most conventional types of filtration used, the demand for single-use filtration has similarly grown as contamination reduction is a top priority. As of 2017, filtration and process chromatography each took equal shares (20%) of the market. This will change over the next five years as scientists shift towards single-use membrane adsorbers and continuous chromatography. Continuous chromatography differs from batch chromatography in that multiple smaller columns (two or more) are connected in series. Each column is undergoing a different phase of the chromatography run at any given time. However, continuous chromatography must still overcome regulatory hurdles before it can be widely adopted by the pharmaceutical and biotech sector. 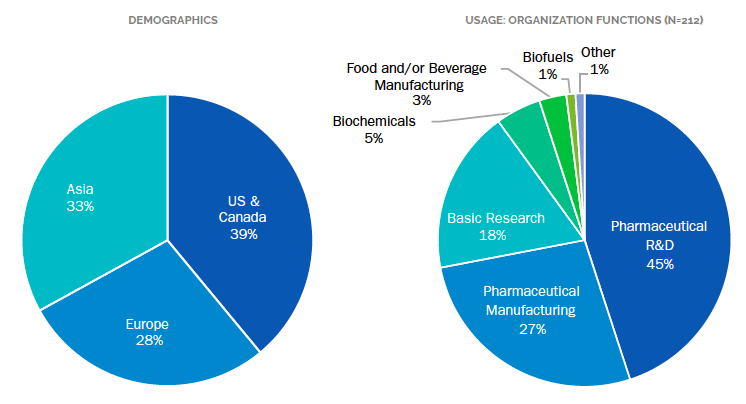 The bioprocess industry overall is very consumables- dependent. For our purposes, consumables which falls under the aftermarket, includes all cell culture media, as well as a majority of process chromatography. So what else, indirectly feeds into the demand for consumables? The initial systems of bioreactors also contribute to the demand for consumables as they require single use bags and other components. Our 2018 Bioprocessing Market Analysis and Perspectives report goes beyond segmenting the industry by technology. We also take a deeper look into global regions, sector type, and vendor share distribution. Stay tuned for the last part of our series where we’ll touch on some end-user perspectives and important players in the industry.